A large-sensor pocket-size 20-megapixel camera that can shoot low-noise, high-quality images through its fast f/1.8 Zeiss zoom lens, and features DSLR-type controls that are highly customizable — sound too good to be true? Unfortunately for the cynics this is a camera that delivers on its press release, with only a few caveats. The sensor is indeed large, but only relative to the point-and-shoot cameras that its body size mimics. Sony describes it as a one-inch sensor, which has little real-world meaning as it measures 13.2x8.8mm. That’s four times the size of a typical point-and-shoot, but less than a quarter of the size of a full-frame 35mm camera, and less than half the size of an APS-C, the cameras that are dominating the resurgent enthusiast market. The lens is fixed (that is, you cannot replace it with another) and zooms from a 35mm-equivalent 28mm, f/1.8, to just short of 100mm, f/5. The body is made from aluminium and feels sturdy but tiny and somewhat awkward in my large hands. Your experience may differ. If you have used any of Sony’s recent cameras like the NEX and Alpha series, then you will quickly adapt to the menus and controls of the RX100. 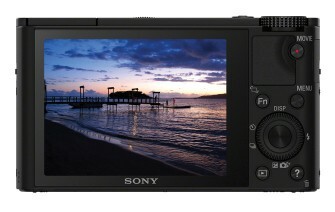 While it doesn’t have the touch-screen of the NEX-5N, the menu system and controls are consistent, detailed and useful. However, to get the most from it you really do have to spend some time configuring the menu, function button and other controls. Once done, just about everything at point of exposure can be quickly accessed using the function button combined with the control ring around the lens. I found the DMF focus setting to be the most useful for the way I photograph, especially when you combine it with the control ring, which when moved instantly zooms in to the focused point, so you can adjust or confirm focus. Focus peaking can help out too; confirming the area you want is in focus before pressing the shutter. The camera sometimes struggles to latch onto the intended focus point though, and there is no simple or direct way to override it short of diving into the menu system, which is the last thing you want to do during focusing. It’s especially noticeable with close-ups when you want to focus on the foreground but the camera insists that the background is more interesting. While the lens is a fast f/1.8 at the wide-angle end, it quickly becomes a slowish f/2.8 by 35mm and a dark f/5 at the longest 94mm telephoto length. This isn’t the camera to show off your narrow-depth-of-field focusing technique. However, at one stop down from the widest aperture there is usually still enough separation between your subject and the background for a much more sophisticated look than you’ll get from the previous generation of point-and-shoot mini-sensor cameras and the current crop of smartphone cameras. The real surprise with this diminutive camera is the quality of the photographs. I shot RAW+JPEG and, in line with previous Sony cameras, the JPEGs are very good. Perhaps slightly over-processed with too much noise reduction coupled with over-compensated sharpening but they just look good, straight out of the camera. The RAWs look very similar in Adobe Lightroom but have more headroom in the highlights and a huge depth to the shadow detail. Especially good as the usual penalty of sensor noise just isn’t there unless you are pushing the file well beyond reasonable limits. The RAW colour is slightly better than the JPEGs. Reds and oranges separate much more naturally, thus avoiding the orange skin tones that can happen in contrasty light. Grass and foliage also separate into yellow-green and cyan-green in a more convincing way. Looking closely at the files at 100 per cent in Lightroom reveals the image detail is struggling to compete with the softly modulated noise of the 20-megapixel sensor. It’s not noticeable at 50 per cent or lower but if you want to print to A3 or larger you will want to process your photos very carefully to make the most of the detailed file. I suspect the RX100’s sensor is better than the camera’s lens. What really surprises though is that this little camera can even come close to such demanding expectations. Due to the camera being recalled unexpectedly by Sony for training purposes, I didn’t get the opportunity to try out the video mode. Online reviews heap praise on its relatively high bit-rate video files, capable of shooting comfortably at 60fps in full 1080p HD and producing footage that has a smooth look to its motion as well as being clear and detailed. Sony seems to be moving faster and with more confidence than its rivals. The RX100 should be a huge success, meeting the needs of both experienced photographers needing a go-anywhere backup camera and a new generation of photographers who want the quality and control of a DSLR but without the bulk and hassle.